Doing TV news is fraught with peril. You might crash a scooter, lose your mind laughing, accidentally eat poison or you might discover in front of a large audience that you aren't mature enough to hear the word beaver without laughing. Even worse, you might have to work with an animal. What with animals not being people, they don't give a damn about the camera or common courtesy, deadlines or personal space. Take, for instance, this cow. It looks like a perfectly fine cow. You might think you could walk by that cow without anything untoward happening. That would be a mistake. 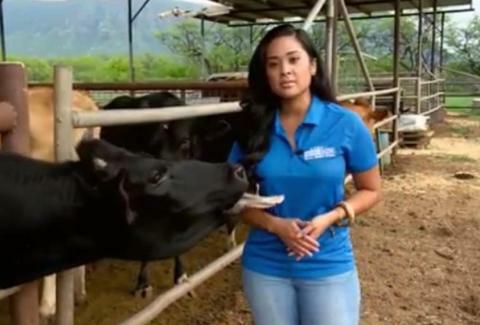 Hawaiian reporter Jobeth Devera of KGMB and KHNL discovered this cow wasn't a gracious guest. Devera was doing a segment on a push for the legalization of raw milk in Hawaii when the aforementioned cow got way too friendly. Way too friendly. Fortunately for Devera, the segment was pre-taped and not live. That means she was able to respond with the proper amount of shock and then re-tape the segment. But she clearly understands how the internet works. She shared the outtake on Instagram and used it to promote her reporting.